The first date of the congregation is unknown but there are certain baptismal records that make it safe to say that the church was begun by at least 1732. It might be older but this is the date that has been celebrated throughout the history of the church. It was during the pastorate of John Wilms in 1798 the congregation determined to relocate to New Holland which had now become a more central location. The old log meeting house “was becoming so dilapidated that it was felt necessary to build a new house of worship.” The old name was dropped and the new name was simply “the German Reformed Church of New Holland.” Along with the move came the construction of the new building. A deed for one acre and six perches was given to the church by Matthias Shirk which also brought the Lutheran and Reformed Churches next to one another which was the common arrangement among these German-speaking congregations in the new world. The back of the deed calls the church “the German Calvinistic Congregation.” The building was of the Colonial design after the pattern of Sir Christopher Wren. Construction began in 1799. The bricks for the building were manufactured on site. “The steeple which rises to 120 feet had the usual ornaments; the huge ball representing the earth as the Lord’s dominion, the weather vane, seven and one-half feet in length; the four points of the compass; and the five pointed Star of Bethlehem at the top. On the woodwork are carved eight angelic figures the meaning of which we do not know. Between these images are four eight-pointed stars which originally were painted blue or gold. Four “points” or ornaments were placed at each corner of the wooden base, the latter possibly signifying the 4 evangelists. Two bells were hung in the steeple. 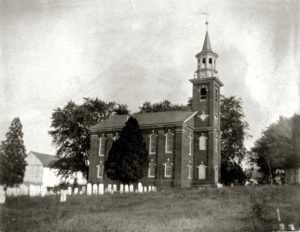 The dedication services for the new building were held on February 22, 1801. During the early 19th century the congregation became one of the largest in the entire denomination. The national Synod of the Reformed Church met here in 1807 and 1818. In the 1830’s or 40’s a division arose in the congregation over language. Should we have an English service or stick with German. The conflict led to a portion of the New Holland congregation moving back out to the Zeltenreich’s location and starting another church to continue the German services though they probably were divided on site in New Holland for some time as well. As time went on there was a need for more space. In the consistory minutes of February 10, 1847, it says “the subject of having the church building internally reconstructed was brought before the Consistory for consideration.” Nothing happened until 1852 and the purpose was to provide Sunday School space. The interior of the building was radically altered. The galleries on three walls were removed and the 8-foot high wine-glass pulpit was removed from the north wall. A second floor was put in and the worship area moved upstairs with the lower floor now dedicated to Sunday school classrooms. The cost of the renovations was $1900. The name was changed to St. Stephen Reformed Church sometime later in the 19th century but the exact timing and rationale is unknown. To address the needs for more space Zwingli Hall was built in1953. In 1968 a classroom building was added and was named Bachman Hall, named for Rev. C. G. Bachman who was the pastor from 1918 – 1959. In the 1988 with the educational space now addressed the church decided to return the church to its original colonial layout. The second floor was removed. The gallery was restored and the pulpit was placed in its original position in the center of the north wall. In terms of the church’s denominational affiliation the congregation was established as a German Reformed Church but then merged with the like minded German Evangelical Church to form the Evangelical and Reformed Church. In 1957 the Evangelical and Reformed Church and the Congregational Christian Church united to become the United Church of Christ. 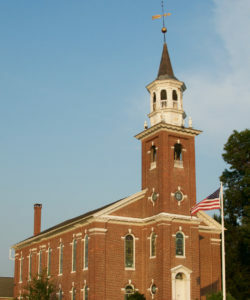 The Congregational Christian Church was also the result of a merger between two denominations. 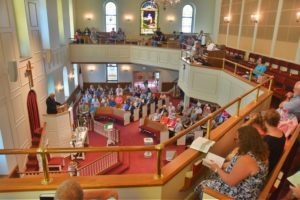 The National Council of Congregational Churches (congregational churches with a Puritan heritage) and the General Convention of the Christian Church. The United Church of Christ, together with mainline denominations began to drift away from their reformed heritage, particularly from the authority of the Scriptures. This would have its impact on the church as it began to decline. On November 23, 2014, the church voted to affiliate with the Presbyterian Church in America which takes it back to its biblical and theological heritage. The congregation was welcomed into the PCA in December, 2015. This placed the church back on a firm biblical foundation upon and the Lord has richly blessed the congregation as He build His Church for His glory. The location of the pulpit is no accident. It’s location and its elevation is designed to reflect the fact that the Word of God is central to our worship and our lives. It is not elevating the preacher but the place God’s truth is to hold in our lives. Throughout its history the church has been known as the Beacon on the Hill. Its newly constructed and well-lit steeple reflects the fact that the Gospel of Jesus Christ shines brightly again at St. Stephen. Interested in visiting St. Stephen?